It's not only X-Men fans that can rejoice! With this Wolverine online slot review, even those who aren't fans of the popular comic and movie series will find that this enticing slot may be difficult to ignore. This machine is part of the impressive Marvel Progressive Jackpot line up that is offered by Playtech, so players know that they are part of a game that can offer massive winnings. Based on the X-Men Franchise, the theme follows Hugh Jackman's portrayal of Wolverine in the film versions of the character. Wolverine is a mutant who has regenerative properties that allow him to heal after being wounded. He has been the subject of experiments and has had adamantium metal claws built into his hands, making him a lethal weapon. Not to worry though - he is one of the good guys and he fights for the right side. The slot is a 5 reel, 25 payline game, with bets ranging from 25 coins up to 250 coins. Available across any casino that offers Playtech games, the slot is part of the progressive series that has a jackpot of up to $250,000. Every time any of the approved Marvel machines, such as Thor and Ironman, places a bet, a percentage is put into a pot that grows until a player on one of the games randomly wins the pot. The game uses the Wolverine symbol as its wild, and it can be spun across any of the 5 reels. This symbol can replace any other symbol, making winning lines much more likely. There is a Berserker Rage feature that offers large earnings if Wolverine appears on any of the 2nd, 3rd or 4th reels, or if it appears in the bottom position. Scatters are also used to increase the odds of winning. The Adamantium Free Games feature is accessed when three scatter symbols are spun at the same time. The players wins 12 free spins plus the chance of spinning more wilds on later bets. 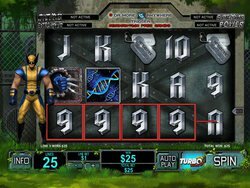 This Wolverine online slot review has mentioned the main features of this slot, but there is really only one way of finding out how fun it is, and that is to play it today! Access online to win big with Wolverine.